WinX HD Video Converter Deluxe is one of the best 4K/HD video converter software available. Now, as part of a giveaway promo held by Digiarty software, you can get this video converter as wll as eight excellent multimedia applications like Easeus Todo Backup for Home and Hard Disk Manager 15 Suite at no cost and get 66% discount on WinX DVD Ripper Platinum, one of the best DVD ripping software for ripping & copying protected DVDs. How is your experience with Windows 10 so far? I am sure you won't complain too much about it if you can endure the fact that Windows 10 is relatively lackluster in terms of media format support even though Windows 10 has absorbed MKV into its roster. If you are a video-savvy user and find the short list of formats supported by Windows 10 unbearable, you might be in great need of a HD video converter, like WinX HD Video Converter Deluxe, to put you out of misery. What is WinX HD Video Converter Deluxe? WinX HD Video Converter Deluxe, all-in-one video software as a 4K Ultra HD video converter for Windows (10), online (YouTube) video downloader, slideshow maker and video editor, gives you an ultimate control over SD, HD and 4K resolution video files. With over 320 video codecs & 50 audio codecs, it owns powerful capability to meet fast and high-quality video conversion needs without assistance of any third-party tool. Now you can free get this valuable HD video converter originally priced $49.95 in a giveaway promo held by Digiarty Software who also presents a vendor giveaway enabling you to get eight excellent multimedia applications like Easeus Todo Backup for Home and Hard Disk Manager 15 Suite at no cost and get 66% discount on WinX DVD Ripper Platinum, one of the best DVD ripping software for ripping & copying protected DVDs. Whether you want to convert HD videos (1080p/4K/8K video, MKV, AVCHD, TS, MOD, TOD, Blu-ray video, etc) or SD videos (YouTube video, AVI, WMV, MP4, VOB, MPEG, MOV, 3GP, Google TV, WebM, ASF, etc) on Windows 10, this converting software won't let you down. Nearly all the mainstream formats are included in the list of output profile, which makes watching videos on smart devices like Apple iPhone, iPad; Android Samsung, HTC; WP8, Surface; Sony PSP, Xperia, etc a no brainer. On top of that, you can personalize the video to your heart's content by enjoying the total freedom of changing the video elements or editing videos with the methods of cropping, trimming, merging, subtitling, etc. Surprisingly, with this 4K HD video downloader, you can free download online music/movie videos of any resolutions like 4096x2160, 3840x2160, 1920x1080, and 1080x720 in FLV/MP4/WebM and other sites supported formats from over 300 video sites on Windows 10, like YouTube, Yahoo, Facebook, DailyMotion, Vimeo, Vevo, Break, MTV, Pandora, CBS, CNET etc. Additionally, Due to the adoption of high quality engine, multi-thread and multicast technology, WinX HD Video Converter Deluxe can deliver a lightning fast downloading speed and identical video quality provided by the original one. This HD Video Converter can also work as a photo slideshow maker on Windows 10, netting you the ability to create an original video jam-packed with pictures you snapped, downloaded from internet or got from others. Another point you can not overlook is that you can add background music to the slideshow and convert the output video to any format you would like it to be. All of them can be done easily. 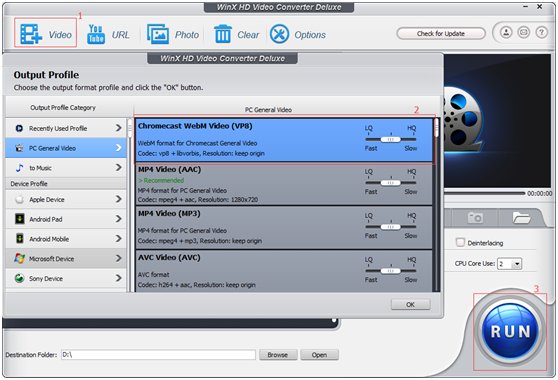 To convert HD video to another format with WinX HD Video Converter Deluxe is as easy as taking candy from a baby. Click "Video" button in the tool bar to load source video. Choose MP4 (as showcased by the picture) as the output profile. Hit "RUN" to get whole process started. A few minutes later, you will get what you want. All things considered, you should never miss this giveaway promo that comes once in a blue moon, featuring one of the best 4K/HD video converters on Windows 10/8/7 etc—WinX HD Video Converter Deluxe.